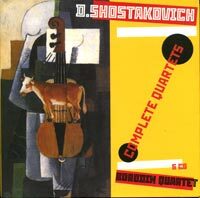 Description: Recorded between 1978-83 (except for the 2 Pieces which date from 1964) this is the set which was licensed to EMI for the West and stood as a landmark cycle for quite a time. Also with an all-English 32-page booklet. 6 CDs. Borodin Quartet, Sviatoslav Richter (piano).